The Connecticut Airport Authority and Travelers Aid are pleased to announce that, last October, Travelers Aid International began serving the passengers of Bradley International Airport as the operator of the guest service volunteer program at the airport. Mary Kate Doherty, an experienced volunteer manager, has been retained by Travelers Aid to manage and expand the program. "We are excited about this opportunity to serve Bradley’s travellers, and we will work with the airport to improve guest relations. We are grateful for this contract with the Connecticut Airport Authority”, Doherty said. “We value our passengers and we are always looking for ways to enhance their travel experience at Bradley International Airport”, said Kevin A. Dillon, A.A.E., Executive Director of the Connecticut Airport Authority. "Travelers Aid brings a wealth of experience and expertise to Bradley Airport and we look forward to bringing an even higher level of customer service to Bradley passengers together." 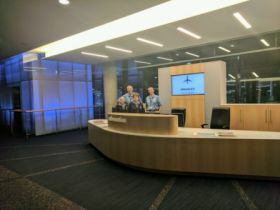 Travelers Aid International currently operates similar guest service volunteer programs at four other airports: New York JFK, Newark Liberty, Washington Dulles and Washington Reagan. In addition, it operates the information booth at Washington Union Station. At these five locations, more than 750 Travelers Aid volunteers assisted more than 4.2 million passengers in 2017. Bradley International Airport will be the 18th airport in the Travelers Aid Transportation Network, which had consisted of 17 U.S. airports, four North American railroad stations and a cruise terminal.